Out of Hand—Is it Ever OK to Throw a Controller? Two weeks ago, a million-dollar contest supplied an interesting prism through which to view the reactions to different people's failure to accomplish the same thing in a video game. In one, a gamer stretched a remarkable achievement into an inhuman streak of perfection, ultimately snapped as much by bad luck as his own physical limitations. In others, their attempts were thwarted much earlier, before they could even be considered any kind of an achievement. The failure to throw a perfect game in MLB 2K12 and the gamer's decision either to not throw a controller into the wall, or to shatter it upon the floor, was likewise either entirely sympathetic, or entirely contemptible. "People who smash $50 controllers are childish douche bags," said one commenter, reacting to this anthology of disappointed gamers' disproportionate reactions. And that's certainly a reasonable opinion. "I would have thrown that tv and system out the window," said another commenter, after seeing T.J. Brida's very sedate response to losing a perfectly pitched baseball game in the 14th inning. And likewise, many of us would empathize. worst reaction ever. I would have thrown that tv and system out the window. 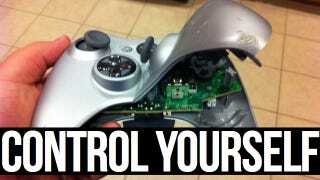 Is controller-throwing ever justified? Is it never justified? What does it say about a video game that inspires such behavior? What does it say about a gamer who lacks that kind of self-control? I've gone to some very dark places in my video gaming career. Remember the Flightstick Pro? That thing was probably $80 in 1996. And I wrecked one playing X-Wing on the Mac. Picked it up by the stick and slammed the base into the desk on the game's penultimate mission, above the Death Star's surface. In 2005, playing The Warriors on Xbox, the game's missions had the habit of switching to a forced perspective—either a platform elevation or an isometric view—and putting you into a minigame that didn't correspond to the controls you had been playing with for so long. On one level I repeatedly failed, I gouged a chunk out of my apartment wall with the controller, which I would spackel over with a toothpaste-and-water mixture before moving. My downstairs neighbor—extremely concerned—confronted me the next day. In a "don't ask" tone of voice designed to get me out of the conversation, I told her that I was dealing with some "personal issues." Yeah, if you're willing to throw an embarrassing temper tantrum and physically destroy console hardware, you probably do have personal issues. Why is it that controller-throwing is OK? I think it's because it's a symbol of the console. A twin analog controller or a gamepad has no purpose other than to play a video game, whereas a mouse and a keyboard has other applications, and therefore destroying it would be even more pointlessly self destructive. It's why the Flightstick got slammed on my desk. But when I played Dark Forces with a keyboard and mouse, I took out my frustrations kicking the trashcan. Do we want to see destroyed controllers? Sure! The post about MLB 2K12 players trashing theirs is the most-viewed post in the short three-month history of Sportaku. No. 2? The narrative about TJ Brida. Readers, even if they weren't sports video gamers, deeply sympathized with his disappointment—even as he made no physical demonstration of that. It also raises up a truth that has been very hard for me to accept as a writer and, to be honest, a basically immature person: Never confuse a natural interest in the spectacle of anger for an actual interest in what is making you angry.